I love my car and I love driving. What’s not to like? Apart from other drivers, of course. But I’m not one of those grumpy old sods forever moaning about traffic congestion. Why is there congestion on the roads? Because everyone wants to drive their car. There are so many things to like about driving. Take road signs for instance. I love these utilitarian messages with their inappropriate melodrama, seemingly intended to evoke a state of mild hysteria. Do you know what I’m talking about? 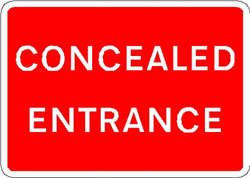 What about Concealed Entrance for example? Surely concealed is the wrong word? It implies some kind of deliberate plot to conceal the entrance. As if someone had created a perfectly normal entrance, and then carefully planted trees and shrubs all around in order to hide it from casual passers-by, like the entrance to the Bat Cave. Oncoming Vehicles in Middle of Road is another favourite. How can anyone read this sign and not feel a deep-down urge to panic? I remember the first time I encountered this, on a narrow humpback bridge where you couldn’t see what was coming over the other side. My heart nearly stopped beating as I drove over the top. What fun! 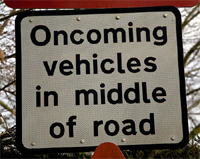 I’m always hoping to come across a related sign, like Out of Control Cars Heading Your Way, or maybe even Turn Back Now! Lunatics on the Loose! 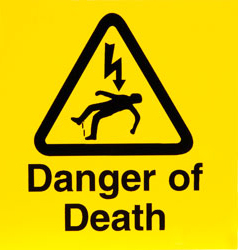 But the all-time number-one best road sign has to be Danger of Death. Its threat of extreme and indiscriminate hazard makes me glance nervously around, half expecting to see corpses strewn along the roadside, victims of some undetermined but fatal danger. It certainly adds an unexpected frisson to the daily commute. Yes: cars, driving, road signs. Surely three of life’s greatest pleasures. This entry was posted in Life and tagged Humour, Words. Bookmark the permalink.